Motorola is to bundle GPS navigation software and hardware with the European versions of its A780 and MPx220 smart phones. The handsets will include ALK Technologies’ CoPilot Live navigation software and Navteq ‘street and places-of-interest’ maps for European countries, installed on a memory card. The Linux-based A780 has a built in GPS receiver hardware, while the Windows Mobile-based MPx220 will require a separate Bluetooth-enabled GPS receiver. 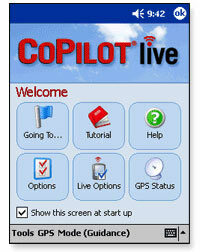 CoPilot Live uses maps and GPS location data to calculate multi-stage routes, displaying turn-by-turn directions on screen and speaking them out loud to avoid drivers crashing into hedges while looking at the groovy 3D map display. The software also plugs into ALK’s GPRS-based tracking system, which allows third-parties to find out precisely where they are and how long it will take for them to arrive at their destination (we fancy there’s a few in this office who could benefit from such a feature after a night in the pub). The product can also quickly plot alternative courses in response to updated traffic news and traffic jams. GPS navigation has proved a bit of a hit in Europe, with sales bolstering up an otherwise declining PDA market. A variety of vendors have busied themselves bundling together low-cost handhelds, GPS receivers and navigation software packages that together cost far less than a dedicated GPS systems. David Quin, ALK’s UK marketing chief, said the Motorola deal was “an important step on the road to mass-market adoption of GPS navigation”. Both handsets use Bluetooth to communicate with a separate GPS receiver. Motorola’s handsets and GPS bundles will be available from “select” mobile operators throughout Europe, with pricing and availability determined by the carriers themselves. The Smart2Go Personal Navigator is claiming to be the first mobile navigation system to combine satellite navigation with an extensive travel guide. For travellers who don’t know their A-Z from their GPS, the Personal Navigator promises to make finding your way around town a breeze, with routes, directions and 3D maps being generated at a click of a button on your PDA/smartphone. 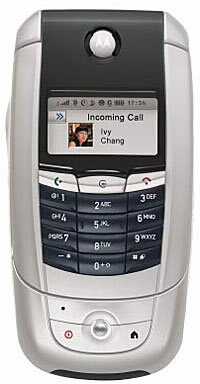 Initially running on Series-60 Nokia phones, the package is supplied with a separate GPS location device that uses Bluetooth to find its precise location. Instead of just serving up a boring old route from A to B, the Personal Navigator digs into its database (compiled by Tele Atlas) to dish up a load of useful local information to guide users to petrol stations, banks, car parks, etc. Hard drinking, wild-living road warriors will be pleased to learn that the program can serve up details of nearby pubs and nightclubs, while more cultured types will enjoy looking up museums, tourist sights, shopping information. Additionally, Personal Navigator can also provide recommendations, updated daily, for events in culture, sports and more – and if you fancy meeting up with your friends, smart2go can send them route details by sms or e-mail. Although Smart2Go is a fully fledged satellite navigation system, it can speed up route calculations by utilising its own maps, stored in memory, rather than making the user wait (and pay) for a connection to an external server. Maps of many European countries and the United States are already available. Locations can be entered through the keypad and the resulting navigation directions are spoken loudly and clearly (available in four languages). Smart2Go are clearly going for the mass market with this application, as it runs on all Nokia Series60-Standard smartphones with Bluetooth and SD/MMC slot. The company is also promising versions of smart2go for MS Windows Smartphone, PocketPC, Nokia Series 80 and Palm OS in the near future. There’s a big future in locations-based services and Nokia are making their move to provide technology for it. As part of the Nokia mPosition System, Nokia is rolling out the Nokia intelligent Gateway Mobile Location Center (iGMLC) 4.0. Teaming up with Cambridge Positioning Systems (CPS), Nokia aims to provide a comprehensive state-of-the-art solution, with the platform supporting a variety of positioning technologies for both GSM and WCDMA 3G. This includes new support for enhanced Cell Identity and Mobile Station-based A-GPS (based on the Secure User Plane (SUPL) protocol) and support for Cambridge Positioning Systems’ SUPL Matrix for 2G. With the Nokia mPosition System allowing mobile operators to build complete end-to-end systems for Location Based Services (while supporting both legacy and LBS enabled handsets), we think this is a significant development. The Nokia iGMLC 4.0 platform will be available in the second quarter. Support for MS-based SUPL A-GPS and CPS’ SUPL Matrix for 2G will be available as a software upgrade in the third quarter. Microsoft recently announced Pocket Streets 2005 as a stand-alone product, although it still remains a component of their Streets and Trips 2005 package. There are two separate stand-alone versions ¯ Pocket Streets 2005 for Windows Mobile-based Pocket PCs, and Pocket Streets 2005 for Windows Mobile-based Smartphones. If you own a Smartphone, you can toss away the compass since the Smartphone version now has GPS support. 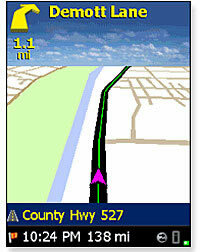 Previous versions of Pocket Streets only had GPS functionality in the Pocket PC version. If you are looking for routing and driving directions though you will still need to consult Microsoft Streets & Trips or Microsoft MapPoint. You can generate directions and maps for Pocket Streets using the 2004 or later versions of MapPoint, Microsoft Streets & Trips, and AutoRoute, or you can download Microsoft’s maps of major cities. Pocket Streets 2005 includes more than 300 maps of North America and more than 275 maps of Western Europe, as well as Microsoft ActiveSync 3.7. New maps are available for Australia, Brazil, and Greece, but these will only be compatible with Pocket Streets 2005. This is an ideal companion for any tourist visiting a city for the first time. You can locate the nearest ATM or service garage, in fact Pocket Streets has an extensive in-built list of bank ATMs and public transportation sites. You can customize maps with personal points of interest, and a new measurement scale feature is expected to determine the distance between locations more accurately. Two useful features will help the more absent-minded traveller. Pocket Streets 2005 opens with the most recently used map already loaded, and you can search for destinations and addresses by using only partial names. Pocket Streets is currently only available in English, but you can download maps that are in any language. It will sell for an estimated retail price of $24.95 (~€19.63).